DUZTECH supplies dust suppression solutions for heavy industries. The company offers a range of indoor and outdoor water cannons, sprays and fan systems to improve air quality and extend the service life of mining machinery. Avoid the cost of investing in equipment by hiring or renting DUZTECH suppression systems. The company offers a number of payment packages, including short-term rental, long-term leasing and rent-to-buy. DUZTECH designs and manufactures water guns and cannons that use pure water to create a micro mist of droplets that to bind with particles in the air and force them to the ground. Dust suppression units are available in several versions to suit the conditions at different mine sites. 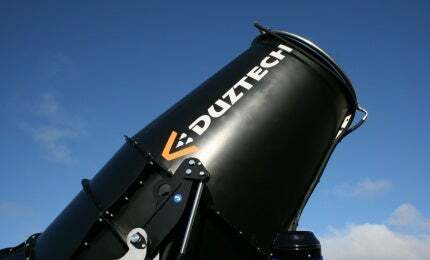 DUTZTECH offers dust suppression systems for general purpose, precision targeting, heavy-duty applications that need more powerful motors, and spray rings and bars for ultra-fine mists. Pumps and filters, waste water tanks, tank trailers and a wide range of accessories are also available, to ensure mine sites gain the correct level of water droplet, moisture and air quality. DUZTECH fan-based dust suppression machines are available in a range of different sizes, with small machines for indoor use and larger machines for outdoors. The machines are ideal for the mining industry as they provide a throw range of up 60º and automatic turning in an area between 15º and 330º. They are silent operating for greater worker comfort and are available with freeze protection, for adverse site conditions. DUZTECH’s products are divided into categories, to make it easier to choose the most suitable unit for each application. The D range provides standard dust suppression and wetting service with water droplet size of 50 microns to 200 microns. The D range is suitable for outdoor applications where the materials and machinery are not affected by wetting. The M or mist range has an added humidification function. M range dust suppression systems have a smaller water droplet size of between 25 microns and 60 microns. As the average droplet size is low, it is ideal for managing applications that produce fine particles. It is a highly versatile series that can be used indoor and outdoor, for humidification and odour control. DUZTECH’s UF-range is designed for indoor use. It provides an average droplet size of 5 microns to 10 microns, delivering ultra-fine water mist through a number of changeable nozzles. It has a lower water consumption rate, and the droplets are small enough for indoor dust suppression without wetting, as well as humidifying and cooling the environment. EVAP units are especially for outside mining applications, as they mechanically evaporate wastewater produced from dust suppression units. DUZTECH EVAP machines are efficient and save storage space and time dealing with wastewater. In order to achieve the desired level of water mist, wetting and power consumption, DUZTECH advises clients on the most effective and economical dust suppression units for their mining operations. DUZTECH is a Swedish company that supplies dust suppression solutions for demolition, recycling, timber handling, bio-fuel handling, odour suppression, firefighting and watering. All products are designed and manufactured in Sweden. The company is committed to improving onsite working environments, as well as following sustainable practices. DUZTECH suppression systems are made with a focus on energy-efficiency, low cost of operation and, as the units use only pure water or air, they have a minimal environmental impact. When DUZTECH dust suppression equipment reaches the end of its service life, more than 94% of the unit can be recycled. Swedish dust suppression machine manufacturer DUZTECH has launched a new mist cannon model at INTERMAT 2015 in PARIS. Duztech creates solutions for dust suppression, humidification and cooling. Water pushed through fine nozzles forms an extremely light mist, and these micro water droplets mix instantaneously with the air, forming a thermal curtain which refreshes without wetting.